We are solving series of problems on the topic mechanical properties of solids. Elasticity is the property of the solid material because of which it is able to recover its original shape and size after removing the external force applied on the body. When the applied force is removed because of internal forces among the body molecules the body comes back to its original position. But this recovery can not happen completely and if that happens body is said to be perfectly elastic body. If the body fails to recover its original position, then the body is said to be plastic body. No body in the nature is neither perfectly elastic nor perfectly plastic. During this process of body loosing the shape some work is done and that work done is stored in the form of potential energy. If the work done in stretching a wire by one millimeter is two joule,we need to measure the work done in stretching another wire of half the radius,half the length but made up of same material by the same extension. The problem is as shown in the diagram below. We know that the work done is stored in the form of potential energy and we know the formula to it. We need to express it in terms of same elongation as well as same Young's modulus and the solution is as given in the diagram below. 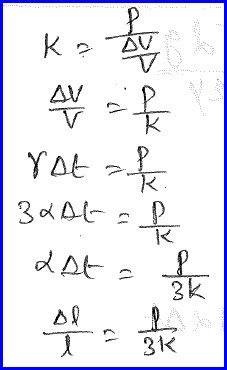 Breaking stress, density are given to us and we need to measure the maximum length of the wire that can be hung from a fixed support with out breaking that wire itself and the problem is as shown in the diagram below. Breaking stress is the maximum stress that the body can experience with out breaking itself. It depends on the nature of the material but not on physical dimensions. 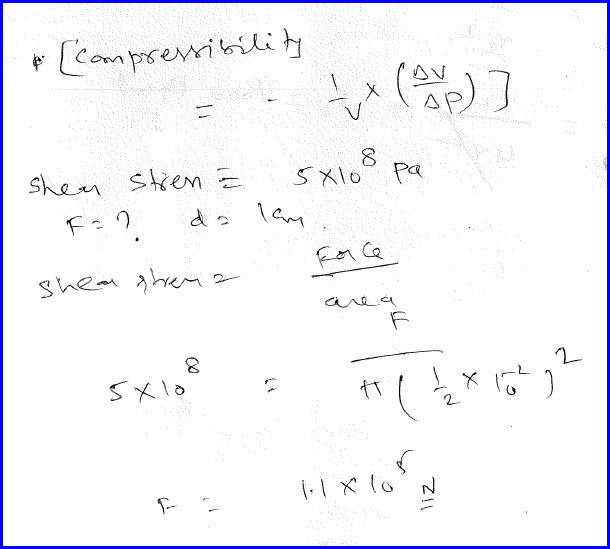 It can be expressed in terms as the product of length of the wire, density of the wire and acceleration due to gravity as shown in the problem below. Stress of the wire is given to us in the problem and we need to measure the force required to much a hole of diameter of one centimeter and the thickness of the wire is given to us. Problem is as shown in the diagram below. 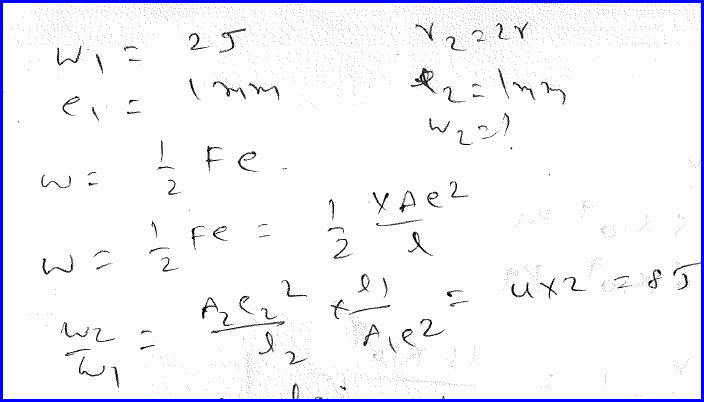 Shearing stress can be expressed as the shearing force per unit area. By applying the data, we can solve the problem as shown in the diagram below. 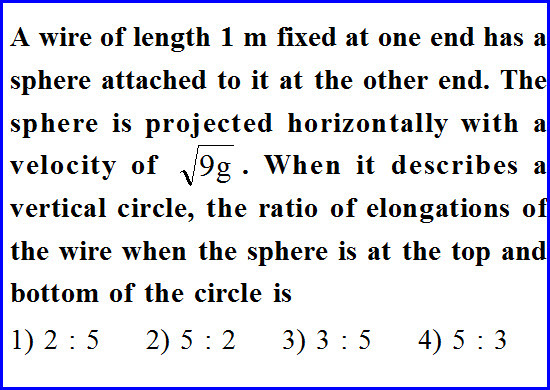 A wire of length one meter is fixed at one end has a sphere attached to it at the other end. The sphere is projected with a known velocity. When it describes a vertical circle, we need to find the ratio of elongations when the sphere is at the top as well as bottom. Problem is as shown in the diagram below. We know that the velocity required for a body to complete vertical circle it need to different velocities at the bottom and top. We also know that when the body is at the top, gravity supports it to come down and vice versa. We also know that the tension in the wire which acts like a force here is minimum when the body is at the top and vice versa. Taking this into consideration, we can solve the problem as shown in the diagram below. A cube of side known is subjected to known pressure from all the sides. We need to find the fractional change int he side of its cube where bulk modulus is given to us. Problem is as shown in the diagram below. We can solve the problem using the definition of bulk modulus as shown in the diagram below. 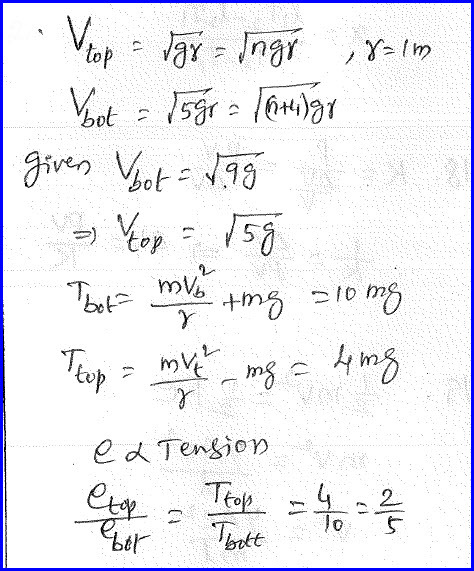 We know that bulk modulus is the ratio of bulk stress to the bulk strain. Problem is as shown in the diagram below.